In May, national elections were held and people elected a government. In democracies, elections are supposed to have consequences. When a party wins a mandate from the people, they are given the right to enact the policies they believe are in the best interest of the nation. In Pakistan, however, we have a topsy-turvy situation in which an opposition party is dictating policy and, in doing so, undermining the very democracy that so many have sacrificed to obtain. 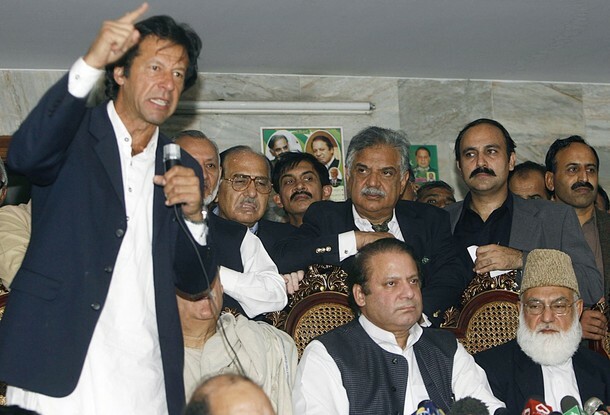 Imran Khan campaigned heavily on an anti-drone, anti-American message and earned a significant following. This can not be denied. But even though PTI was able to gain 35 seats (up from zero), they were nowhere near obtaining a majority and forming the government. That prize was awarded by the people to PML-N. Even with a minority share of seats, however, Imran Khan has been dictating policy to the federal government. After a drone attack killed a Haqqani Network militant leader in KP last month, Imran Khan organised a blockade of NATO supplies against the wishes of the federal government resulting in attacks against NATO containers. Prime Minister Nawaz Sharif has termed the blockade as ‘counterproductive’ and requested Imran Khan to stop the protests as they are causing harm to the national economy and heightening security threats. Representatives of NATO countries have also requested Imran Khan to end the blockade which he has also refused. The question on many minds now is who is in charge? If foreign countries are now making requests to Imran Khan, what exactly is the role of the federal government and particularly the Foreign Ministry? For the first time since four years the US Secretary of Defence has traveled to Pakistan to meet with Prime Minister and Chief of Army Staff. Pakistani media has predictably focused on the diplomatic explanation that the visit was “in recognition of the tremendous support that Pakistan has provided in the war on terror”, but foreign media notes that the true reason for the visit was quite different. Defense Secretary Chuck Hagel warned Pakistani leaders Monday that if they don’t resolve protests stalling some military shipments across the border with Afghanistan, it could be difficult to maintain political support in Washington for an aid program that has sent billions of dollars to Islamabad, defense officials said. During the Pakistan meetings some of the more contentious issues also were raised, including Islamabad’s opposition to ongoing CIA drone strikes and Washington’s frustration with Pakistan’s reluctance to go after the Haqqani terrorist network, which operates along the border and conducts attacks on U.S. and coalition troops in Afghanistan. The officials acknowledged that little progress was made other than to agree to continue talking. In other words, the American Defence Minister met with the Prime Minister and COAS to ask this very question: ‘who is in charge? You or Imran Khan?’ This question was likely paired with the message that they needed to take back control of their country or else to face the consequences. With 2014 merely weeks away, and the American decision on whether to invoke the ‘zero option’ in Afghanistan, these consequences could be existential. The question remains, is Pakistan a functioning democracy? Or is it ‘Imran Über Alles’? This entry was posted in Blogs and tagged democracy, drones, Gen Raheel, imran khan, Nawaz Sharif, Pak-US relations by Mahmood Adeel. Bookmark the permalink. We all know that you are an American paid agent.Stop liking your masters feet and work for Pakistan.Every body is against drones exept people like you who are paid agents.Pack up your bags and leave Pakistan if you can’t defend our national interest against terrorist americans who are killing Muslims all over the world with help of their paid agents like you.